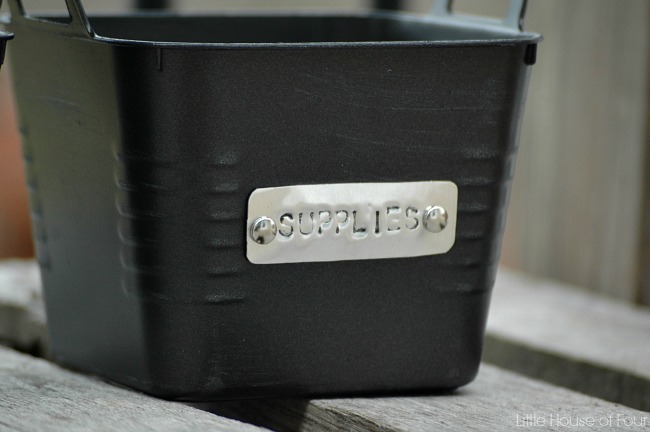 Update basic Dollar Tree storage bins with custom handmade metal tags. 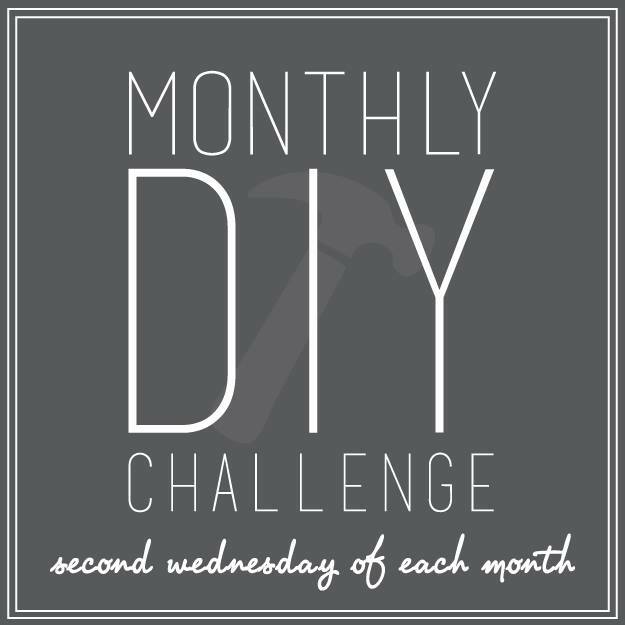 It's time again for another Monthly DIY Challenge! If you're new around here, each month a bunch of my bloggy friends and I pick a theme and "challenge" each other to create an item. This month's theme was the Dollar Store and I couldn't be more excited. You probably know by now that I love decorating and updating my home but hate to spend a lot of money. 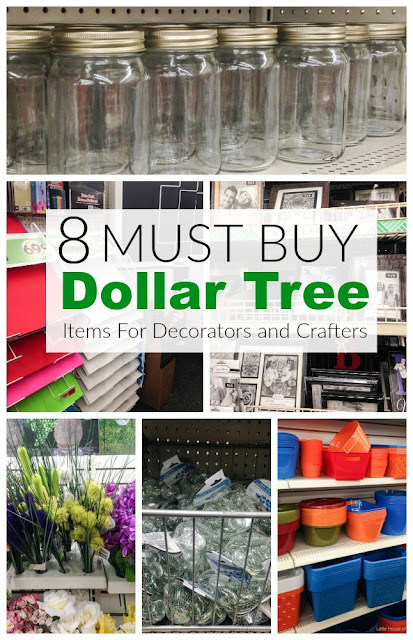 I tend to lean towards less expensive home decor items that I can tweak and alter to make my own. This months Dollar Store theme was right up my alley and I couldn't wait to head out in search of a great item to update. 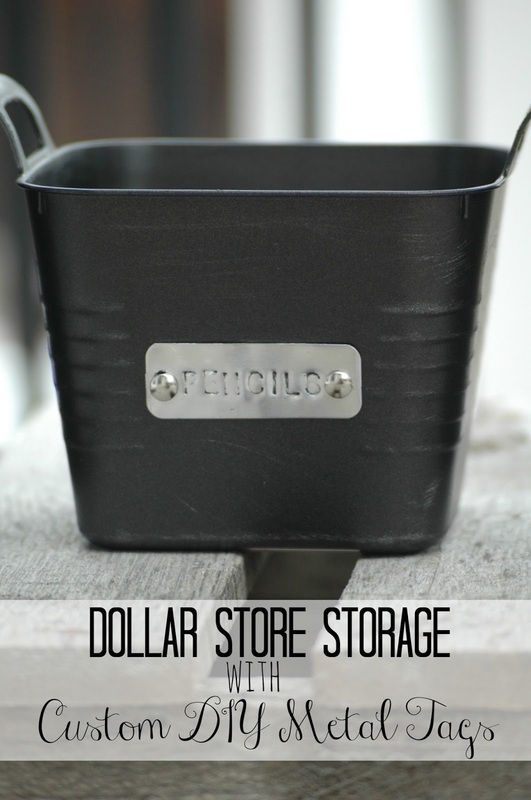 You may remember my previous Dollar Store bins that I updated with a little spray paint and my favorite brass pulls. I use those bins in my medicine cabinet to store Q-tips, cotton balls and band-aids. 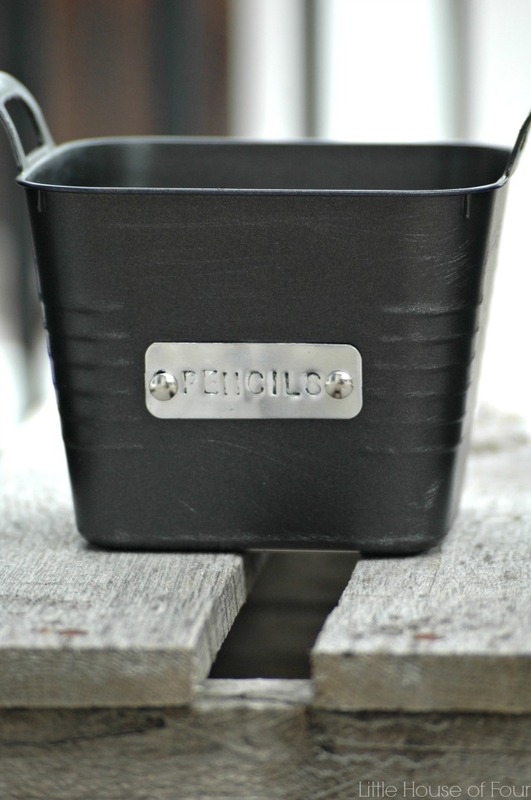 They are such a great and inexpensive storage solution and I knew for this challenge I wanted to create more bins. 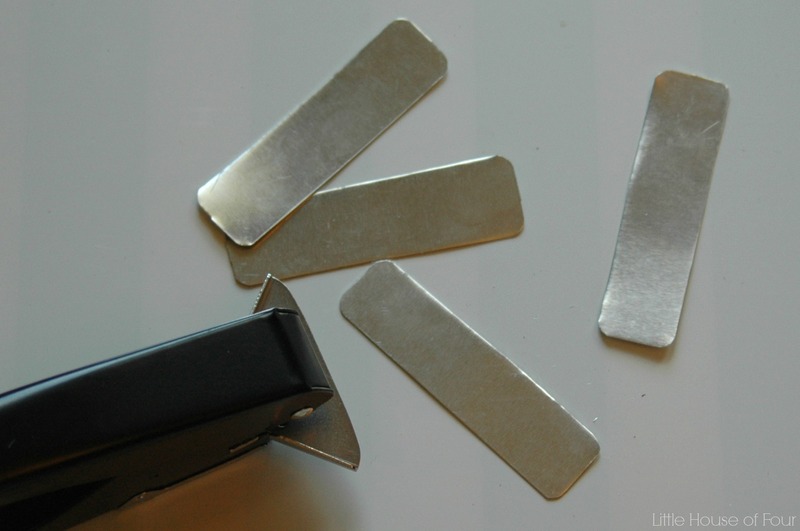 This time, instead of using store bought labels I opted to create my own custom metal tags. 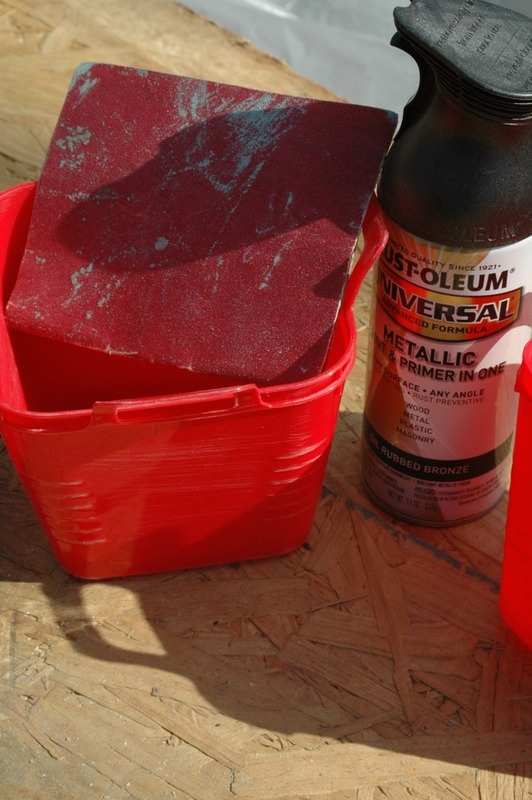 I started by lightly sanding the bins to ensure the paint had a good surface to stick to. I actually went a little crazy with the sandpaper in a few spots, so make sure to do this step gently and use fine grit sandpaper. After a few coats of my favorite ORB spray paint I was ready to start working on the labels. 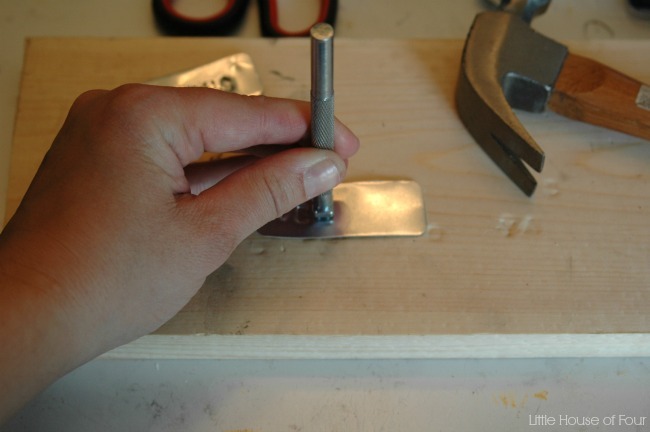 I started by cutting a few pieces of sheet metal into thin strips. I have a tool that cuts the corners off the edges, but you could easily do that by hand if you don't have the tool. 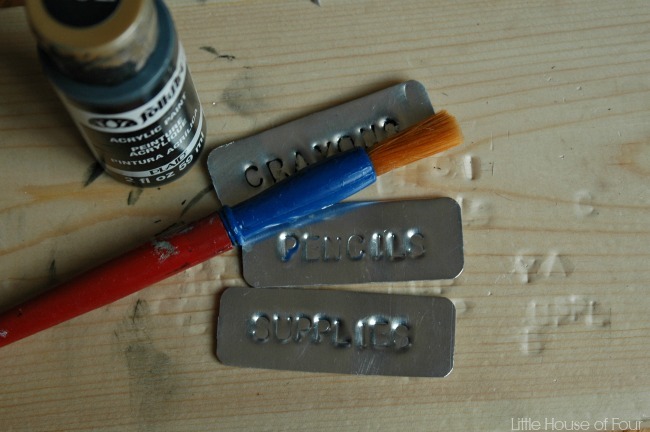 I then took my alphabet stamping kit and stamped each tag. After I was done stamping the tags I decided to paint the letters with black paint so they would stand out a bit. I just brushed on some paint, let it sit a few seconds then wiped off the excess. When you're done stamping the letters the tags will more than likely be uneven. You can easily smooth them out by turning them over and lightly tapping them with a hammer. 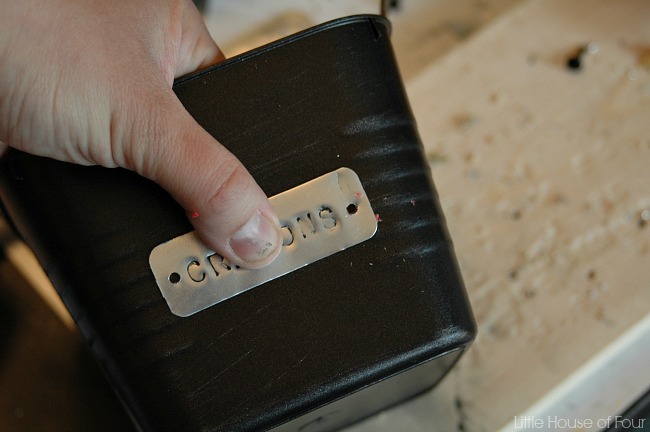 Once my tags were nice and smooth, I used a small drill bit to drill holes in both the tags and bins then attached the tags using brads. As much as I love my living room to look pretty, it also has to be functional for our family. With two school-aged kids, that means we need lots of art and school supplies handy. 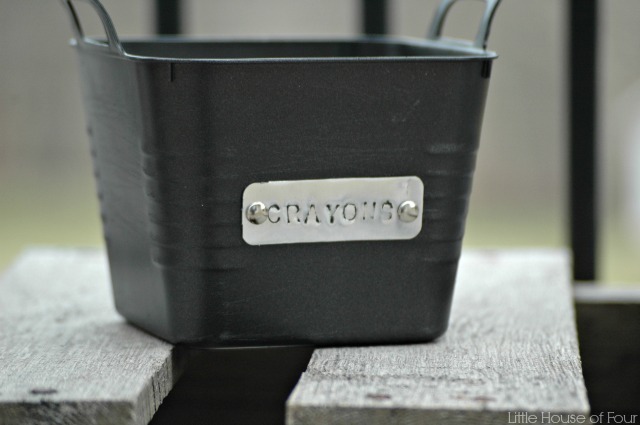 These bins are a perfect compromise for being both functional for the kids and pretty for me. 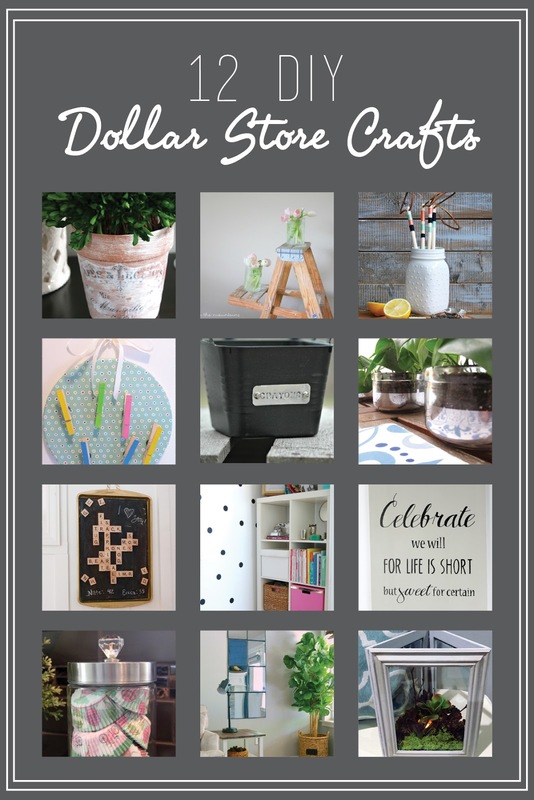 Now that you've seen my project, check out the other fabulous Dollar Store ideas! Aww, thanks girl! So glad you like them! These are too cool, Katie! Such a creative idea! Amy is right, you do have a gift at upgrading inexpensive items. Nicely done, my friend! Oh my goodness! Those metal stamped tags are SOOOO cool! LOVE how these turned out! 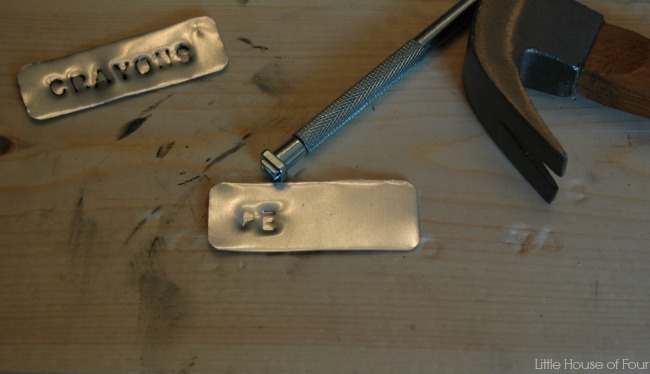 Love the hand stamped metal tags!!! I think I need to get my hands on a stamping kit! So cool! Thanks Nicole! Everyone needs a stamping kit, right?!?! Aww, thanks Bre! It has my wheels spinning for future projects too! I'm sure you'll come up with some great project ideas! Wow, one of smartest & niftiest projects I ever seen!! Love them!! Katie, these are so adorable and look wonderful! 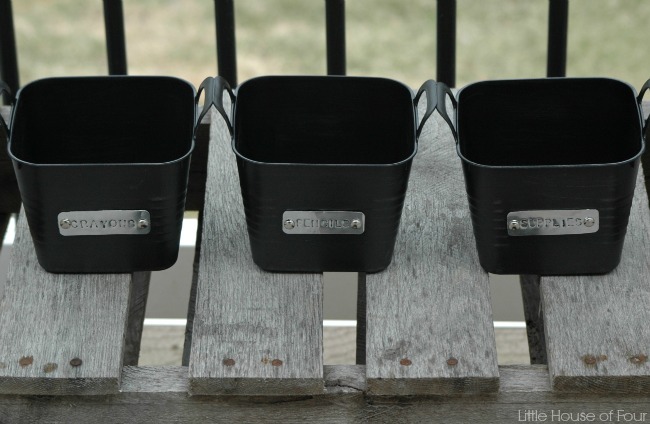 I would have never thought of this with those little storage bins...I usually walk right past them! Very creative! 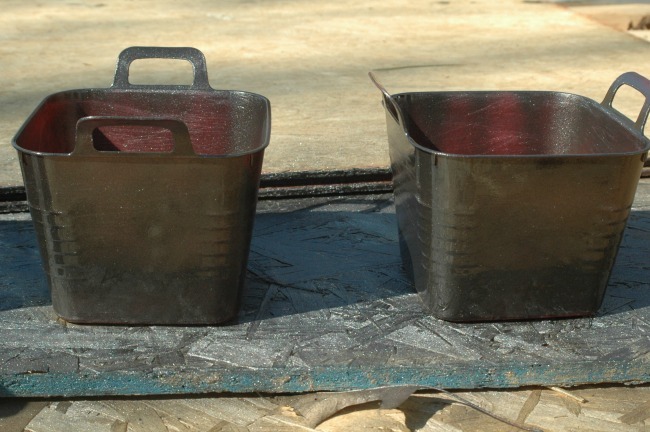 Those bins totally look like metal now that you've spray-painted them - brilliant! Also I just adore anything that is metal-stamped and these labels are totally right up my alley. I just got a stamp set a couple months ago - I might need to make some of my own! 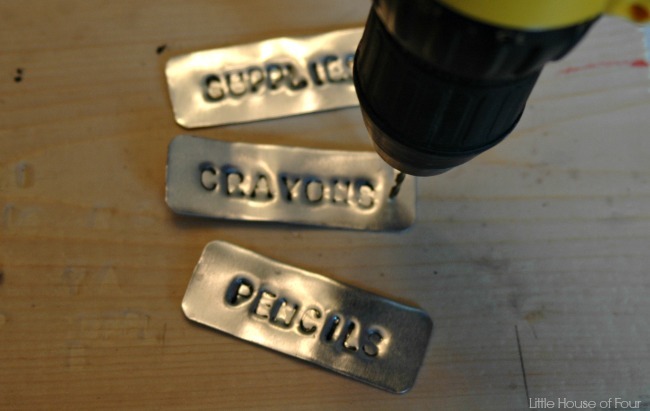 I just love the look of those hand-stamped metal tags!! I always love a good label, but these also add so much character! Thanks for linking up with us at The Creative Circle! So very cute - love those labels! Thanks so much for linking up on Cook it! Craft it! Share it! last week! Love these. They have a very industrial feel to them. I may use this idea when I start re-doing my son's big boy room. Gorgeous! Here from I <3 Organizing. 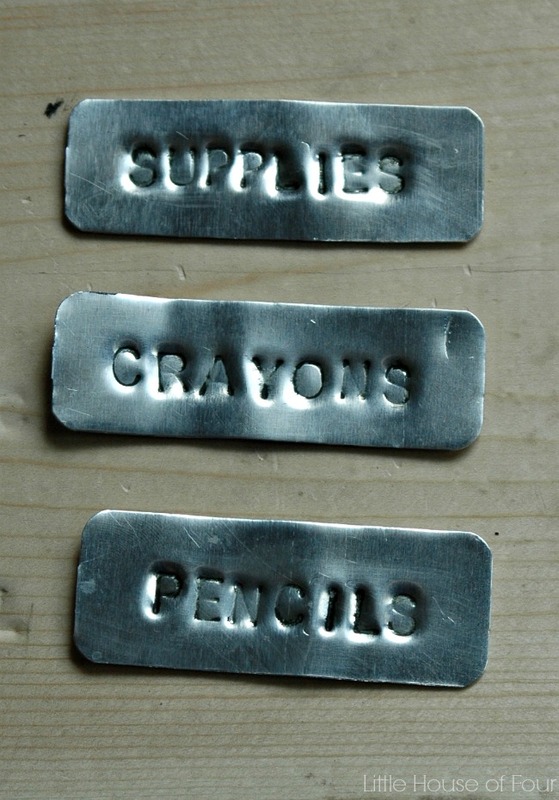 Those metal tags are very nice, and what’s even better is that you can make them out of metal sheets— even just from scrap. Those kind of products with those kid of tags would probably be quite expensive in stores. Thanks for sharing this with us, Katie. All the best! Bernice Parsons @ Badger Anodising Ltd.